A couple of months ago, we started a work weekend with cleaning out storage spaces. We unwrapped some bubble wrap to find this damaged photograph. Things are always being donated to the ship and we try to rotate artifacts and pictures every few years. This one had not been placed out, due to the fragile condition of the picture. We were very excited to read that this is a photograph of an Armed Guard unit that served aboard the JOHN W BROWN. With the date of the photo on the bottom we knew just which voyage this Armed Guard detail sailed on. 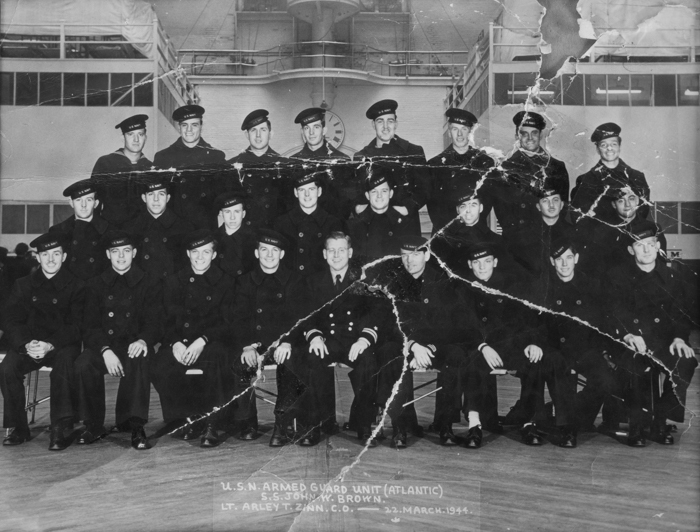 Luckily one of our crew members happened to know the right person to restore this picture. This is the image that the restorer, Summer Kelley, was given to work on. This slideshow will move you through ten hours of work to the final image below. What a difference lots of hours of skilled work make! This is the final image and it will be displayed in the Armed Guard Museum on board ship. We also found a box with several items donated by veteran Paul Baran. He served in the Armed Guard on several ships, including the JOHN W BROWN. We found a diary that he kept that was addressed to his wife Josephine. It also contained lots of great photographs of his voyages and we're going to share some of them with you below. Communication between ships in a convoy was very important. 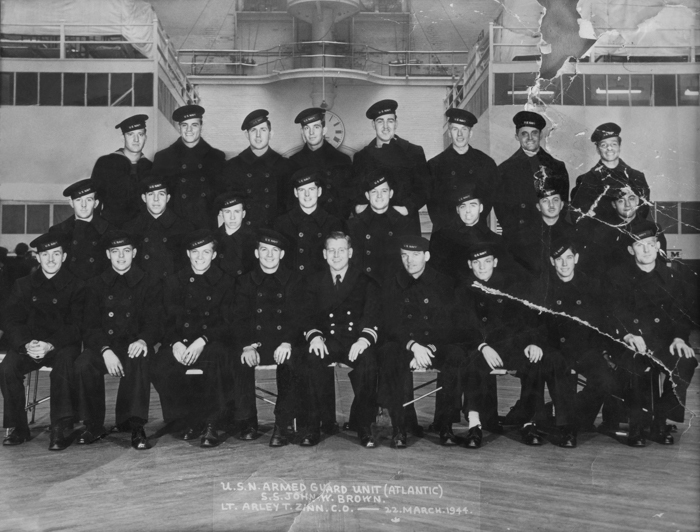 One in twenty six mariners serving aboard merchant ships in World WW II died in the line of duty, this is a greater percentage of war-related deaths than all other U.S. services. It wasn't all work. The ship seems to be in port and the gun crew are taking some time to relax. Though we don't have much information about the Baran pictures, we still have his notebook (in the form of continuous letters to his wife) that needs to be read fully and there may be some details about his shipmates, friends and service. We can tell there are future 'blogs in the making' in just that one notebook by Mr. Baran. Even without specific details, we love seeing old pictures of our ship, and hope you do, too. Routinely, things are mailed/dropped off and donated to the ship and we were contacted in the last 2 weeks by someone in Virginia who bought a storage locker and found a bunch of pictures of the BROWN to be one of the things inside. They contacted us to see if we'd be interested in getting them, so we are patiently waiting for the newest additions to our archives. At this very moment, we are working on multiple projects that are highlighting artifacts donated to the ship over the years, and these will be displayed throughout the ship and the museum spaces. Come check us out. Next cruise is on June 13th!